*Giorgio strolling Via Monte Napoleone this morning. Though I love Rome's fashionable and financially astute sister in the North, I visit Milan visit with the frequency of the fiscal calendar's quarterly reports. About once a season, day-trip or a few night stay-over. Most of the time, I am as focused as on-floor trader with the things I have to get done. I run in and run out out of taxis, trains and appointments but recently I've decided I just need a few Sundays in Milan to [pretend that I] live here. It's sunny, it's raining, it's cold, it's hot. It doesn't matter. I have an unstoppable routine. Milan's vintage trams- I hop on a tram to Via Monte Napoleone, the fashion high street. Thankfully it's early, the shops are closed and the neighborhood residents are fabulously dog-walking or strolling. It feels like that scene from 1961's One Hundred and One Dalmations, or an en plein air/street style cat walk. I spy white-on-black-velvet and I'm pretty sure it is Giorgio Armani. Why not? His hotel is around the corner and he is Milan incarnate. Thanks to the requisite Art History 101 class and a painting by Andrea Mantegna, the Brera gallery became a second home that I have to stop by every time I am in Milan or I feel guilty. Sala VII: A gallery shuffling and renovation placed Mantegna's Il Cristo Morto ~ The Lamentation of Christ, (1480s) at the end of a hallway in Sala VII-- a room of its own, a dark cave-- hanging at knee level. Eery and mesmerizing. 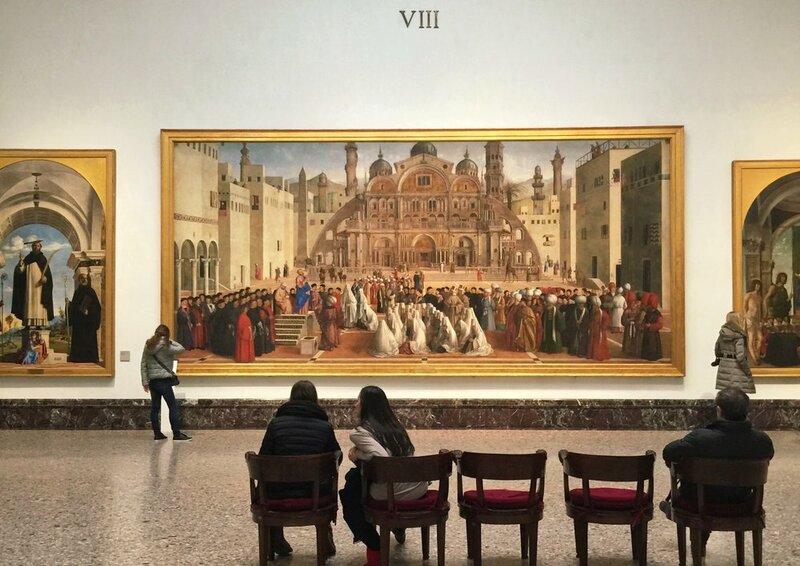 Sala VIII, or as I like to call it, The Room of Looking at Monumentally Big Paintings. This room is my second favorite for watching people watching art and then also for me to take a long breath to enjoy painting. Gentile e Giovanni Bellini's La predica di S. Marco ad Alessandria (Sermon of St. Mark of Alexandria) is the center piece- and I love entering from the main hall but since the new setting of the Mantegna, I suggest chronological order- just for shock effect of dark and light/ tiny and huge. Sala XVIII: The restoration lab. This is another reason why I love the Brera-- a glimpse into the technical, painstaking and painterly process of restoration. Sala XXIV: A Caravaggio party ~ Luca Giordano, Orazio Gentileschi, Carracciolo and of course, Michelangelo Merisi and Supper at Emmaus (1606). There is no elbow room where there is a Caravaggio painting. Sala XXXVII: That seafoam blue, those white arches, those chairs!... and Giuseppe Pellizza da Volpedo's Fiumana (1897), a pre-painting to his famous Il Quarto Stato, a painting that I have been obsessed with since 1992 which now hangs in the Museo del Novecento. I'm done. I'm out. I need to think. 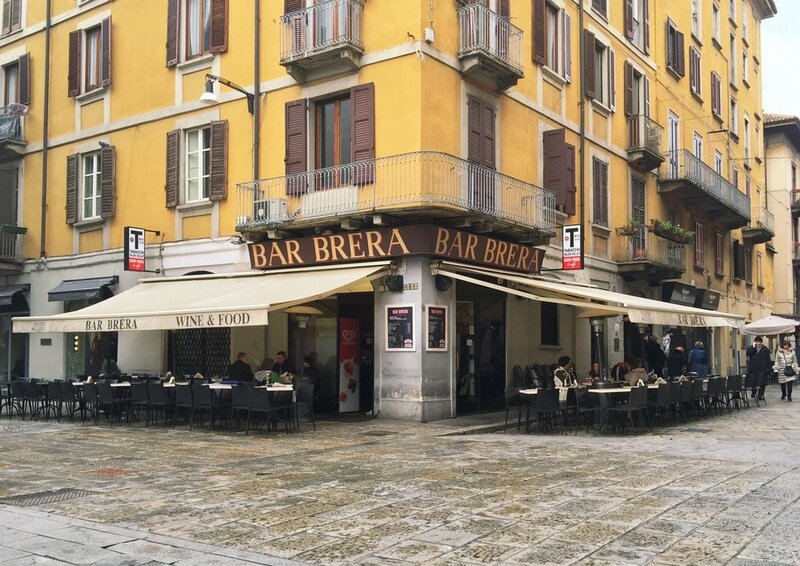 So I sit myself down at the crossroads of art and fashion, the corner of Great Paintings and Gucci, aka Bar Brera and I pull out the FT's weekend insert. Really. And then I start people watching. I'm in Milan and it's Sunday. Thank you, Principe di Savoia for giving me the opportunity to enjoy a care-free Sunday in Milan, before a few long days of work. The Ambassador Suite has been the perfect haven and hideaway to get back to.